West touched on many, many other issues as well, including his own mental health. He said he had been diagnosed with bipolar disorder, but that "a neuro psychologist who works with athletes from the NBA and NFL" told him he simply had sleep deprivation, "which could cause dementia 10 to 20 years from now." 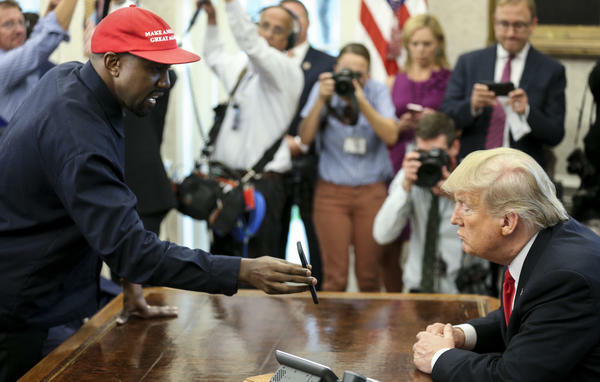 West said that when he tells liberals that he likes Trump, they tell him, "Oh but he's racist." His voice rising, West said, "You think racism can control me? That don't stop me, that's an invisible wall." One of the subjects he said he was planning to discuss with the president was sentencing reform, and said stop and frisk "does not help relationships" in his home city of Chicago. Trump, who has called for police in the city to adopt the controversial practice, then said he is "open minded" on the issue. Trump was asked if he thought West could be a future presidential candidate, and responded "could very well be." West then said, "Let's stop worrying about the future, all we really have is today." He said Trump is "on a hero's journey right now, and he might not have expected to have a crazy motherf***** like Kanye West" support him.